The wisperers use zombies as a weapon, controlling various sized herd, including some of many thousands in size. They use herd instinct to control the herd from within- the zombie herds function much like any other herd animals. You ever see a cow pasture with a random trail to nowhere in it? Those occur because one animal takes a notion to go across the field and all the others follow out of curiosity. The stupid cows then use that same trail until they beat down a path. The wisperers use that "follow" instinct to move and direct the herds. They use other instincts to do other things, too. It's very effective as a weapon. Think about how the survivors have had to combat random herds. Now imagine a directed herd of thousands used against them. Sweet! So, not evolving zombies. Devolving humans. As far as I'm concerned. Sounds like they're probably going to take a great idea with tremendous potential, and turn it into crap. Oh, and I heard today that Andrew Lincoln has already signed on for multiple Walking Dead movies. Just finished watching it, this episode was pretty predictable imo lol, I knew he would live and get taken in the helicopter with Anne, overall not bad though. If I'm not mistaken, I noticed the song that plays when Rick is being helicoptered out is the same song that plays at the end of the very first episode when Rick gets trapped in the tank. But I'm actually excited for the whisperers arc. I'm guessing they'll seriously tone down the depravity/brutality for the TV series though. I suspect you are right on the "tone down" at least to a degree. I liked what happened. Pretty much what I expected so there was no shock factor but it opens up a whole lot of possibilities that they can do with the show/shows. I did NOT expect that far of a time jump. I expected Daryl to assume some of Rick's and Carl's storylines, I didn't expect Judith to assume the Carl role. Was not expecting the time jump but it does kinda make sense seeing as how Chandler Riggs was getting a bit too grown up to be playing the younger Carl of the comics. Plus, now we have a beard wearing, hand missing Aaron that could step up to cover for Rick. I'm also hoping it opens up the storyling of the show to send Daryl off on his own "on the road" adventures. Since he isn't in the comics they pretty much have free reign to spin his story into whatever they want. I caved and watched Sunday’s episode. I loved seeing Shane and Hershel again and it was a fitting send off for Andrew Lincoln IMO. I’m a big fan of the comics and not so much of the TV show. In my perfect version of the show they would have stuck to the comic version and killed off that PITA psycho, MarySue’d Carol back at the prison a couple seasons ago and Carl would still be alive. Oh well. It’s nice that so many people enjoy the show, but personally, I think it jumped the shark a while ago. It was an ok segment. But man alive. That rebar through the liver region, and all that blood loss? Shock and death, as a Zombie Snack. It’s the only episodic TV show I watch, so will continue. Don’t watch “upcoming episodes.” Ever. Don’t need to be enticed to watch a show I’ve already decided to watch. And I want the episodes fresh and unsullied by my knowledge of what’s going to happen. 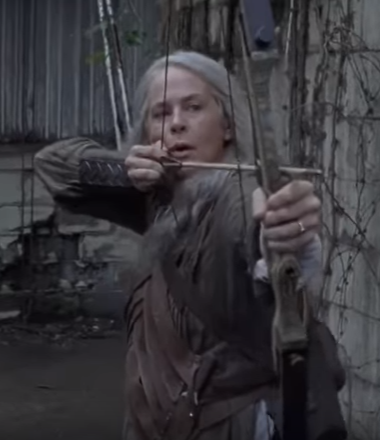 Tonight's episode was probably one of the better ones ...Carroll is back...and Judith rocks. Last episode's fight tween Carols group & the Savior thugs was finally resolved, with fire, 5 years on. Not enuff new children at Alexandria. Breed or die out, people. Even without Rick, tonight’s episode was good. Many other worthwhile actors can carry the load. On rewatching "Don't let them get away" said a zombie/whisperer. I think they are going to ease Aaron into Rick's role. Actually, no. No you don’t.